With the introduction of, CinemaScope in the very early Fifties, Cinemas had hit back at the success of Television – Cinemascope had done what it set out to do — help bring back some of the audiences lost to television. With TV still in Black and White for years to come , 20th Century-Fox insisted that all their CinemaScope pictures had to be in Colour and Stereo, although the stereo sound stipulation was not long adhered to, but they did keep the Colour rule. Regal Films – a B Movie company managed to persuade Fox to let them use the Cinemascope format for Black and White films – by changing them to REGALSCOPE. Effectively the same as Cinemascope but in Black and White. 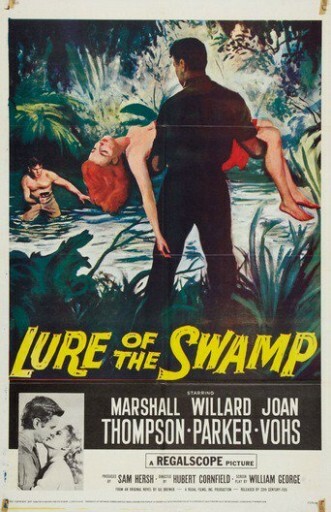 Around 50 RegalScope films were made in the late Fifties — all of them cheap, most of them Westerns. These Westerns star folks like John Agar, Jim Davis, Beverly Garland and Forrest Tucker. Eventually as time went on Fox would drop its colour for Cinemascope stipulation and so we got some terrific black and white CinemaScope films like Forty Guns (1957), Sink The Bismark! (1960) and The Innocents (1961). Regalscope films tend to be hard to find but I do have a wide screen version of The Abominable Snowman with Peter Cushing and Forrest Tucker which is very good, but usually a pan-and-scan transfer doesn’t look good at all. Above: The Quiet Gun (1957), a good little RegalScope picture directed by William F. Claxton. It is a decent enough thriller, seemingly filmed entirely in the Florida Everglades, which does lend a dramatic background. The storyline centre on Simon ( Marshall Thompson) who rents boats for swamp excursions and as a result he gets mixed up with bank robbers who hide their contraband in the swamp somewhere. The Production Company got their money’s worth with Marshall Thompson who is nearly in every shot, not so surprising as the cast is very small. He does a good job. The real scene-stealer is, of course, Jack Elam in typical Elam-style. There’s been nobody like him before or since, and here he is on fine form. The action may be slow to build, but is still not without interest. 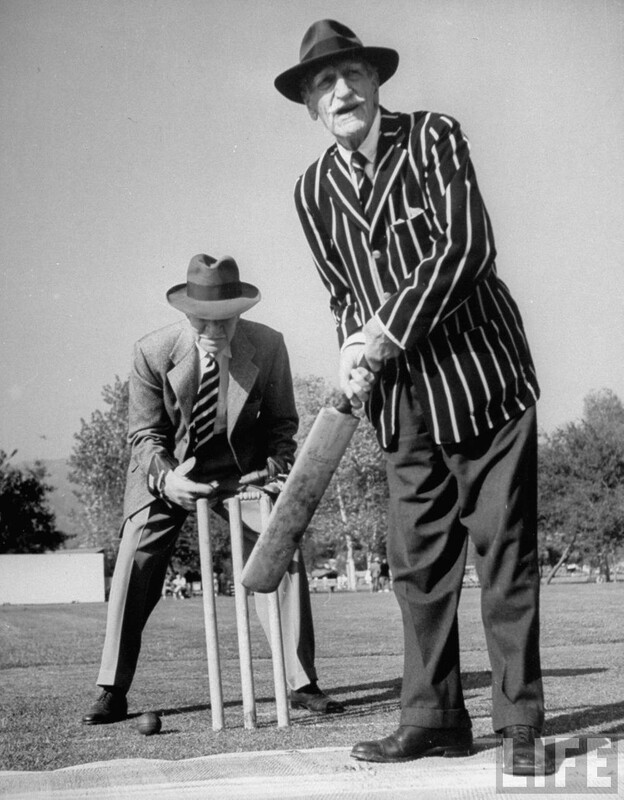 The Hollywood Cricket Cub was founded in 1932 by C Aubrey Smith, an ex-pat British character actor who specialised in officer-class types, and was a good enough player to have captained England for one Test match in South Africa in 1889. Smith was helped by the hugely famous actor Boris Karloff – in reality a south Londoner called William Pratt – and in its pomp the club could put out teams that featured Karloff, David Niven, Errol Flynn, Cary Grant, Basil Rathbone, Nigel Bruce – who played Dr Watson to Rathbone’s Sherlock Holmes – and Ronald Colman. Female stars like Elizabeth Taylor, Joan Fontaine and Olivia de Havilland would take tea in the clubhouse on Sunday afternoons. 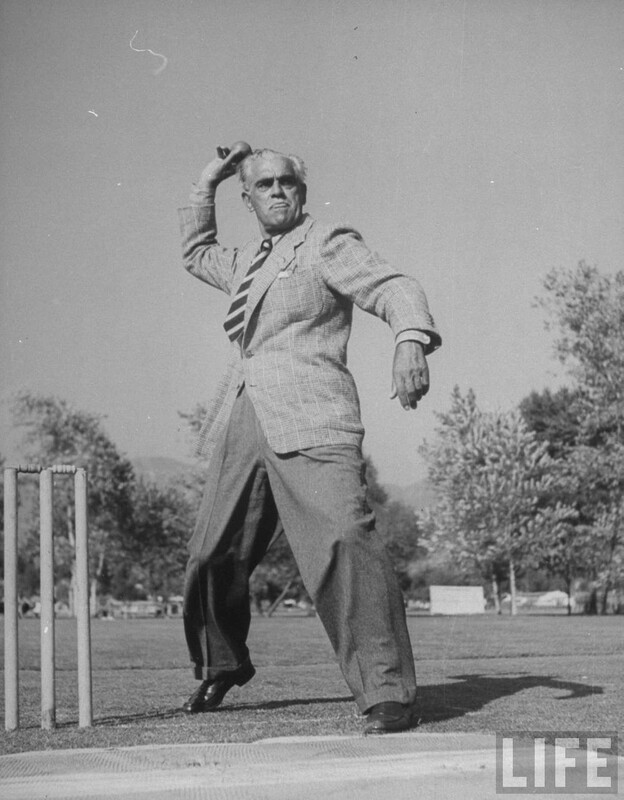 Boris Karloff, pictured above bowling, at an match in 1948 for the OCC (Overseas Cricket Club). Novelist Evelyn Waugh satirized the HCC and C. Aubrey Smith in his novel “The Loved One”, calling him Sir Auberon Abercrombie. Elizabeth Taylor and Cary Grant attend a benefit match. 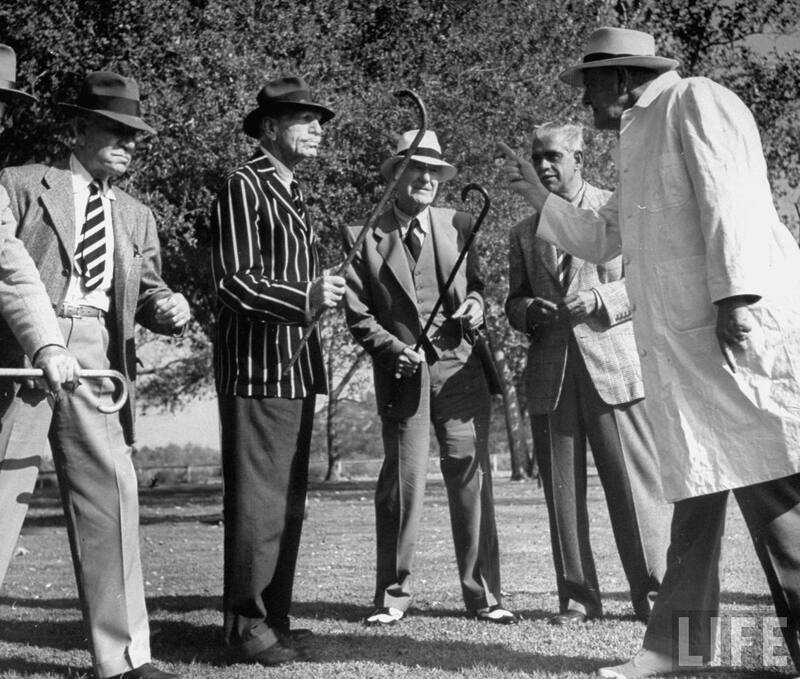 With such a cast, one imagines life was lively at the club. David Niven and Errol Flynn lived down on the beach in a place nicknamed Cirrhosis-by-the-Sea. They enjoyed all the benefits that being a film star brought them to the absolute full. I think they were very naughty boys. Sadly the glory days of the Hollywood Cricket Club are over. 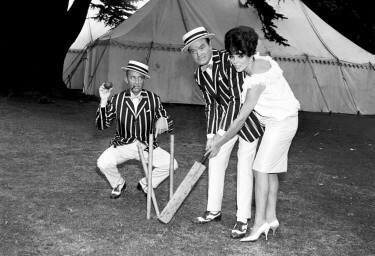 In the early era those actors knew their stock-in-trade was their Englishness and they maintained it through their lifestyle with the Hollywood Cricket Club. The more English they were the more saleable they were, in a way. It was a brand extension. Today though British actors routinely play American roles and what was once a three-week journey from the UK to LA can now be done in ten hours. So the social side, almost inevitably, died out. Below: Bob Hope and Bung Crosby with Joan Collins filming The Road to Hong Kong – the picture has no connection with the Hollywood Cricket Club – this film was made in England at Shepperton Film Studios – BUT then again the connection could just be CRICKET !! !